To make the pickle, mix the vinegar, sugar and salt together in a medium-sized bowl until dissolved, then add the onion. Set aside for 30 minutes. Meanwhile, to make the batter, put both flours into a bowl with the salt. Make a well in the centre, crack in the eggs and whisk together while adding the milk and water as you do. The mixture should be the consistency of double cream. Stir in the melted butter and allow to stand for about 30 minutes. Put a large non-stick frying pan over a medium heat and wipe with some oiled kitchen paper. Pour in a ladleful of batter and swirl to coat the base of the pan. Cook until the pancake is golden underneath, then flip over and cook the other side. Transfer to a plate and repeat until all the batter is used up. Mash the cream cheese with the horseradish, lemon zest and juice until smooth, then stir in the capers and a little freshly ground black pepper. Put a pancake on a piece of parchment paper and spread a spoonful of the cream cheese mixture on it. Add a layer of smoked salmon and a little of the drained pickled onion. Put a second pancake on top and repeat until all the pancakes, cream cheese and onion are used up, ending with a thin layer of cream cheese on top. Wrap the stack in clingfilm and refrigerate for at least 2 to 3 hours to firm up. 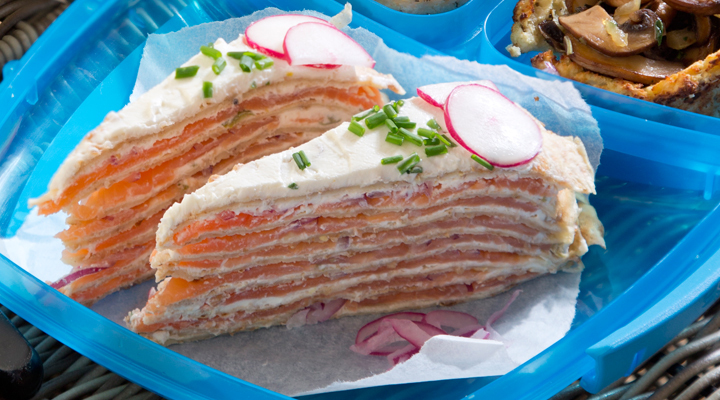 Impressive Tip : The smoked salmon pancake stack is a bit of a showstopper, especially if you decorate the top. Present it whole at a picnic and then slice as needed. You only need thin slices, as it's very rich, so it will feed a big bang.